Photo copyright 2005 Auto Imagery, Inc.
Tony Schumacher, two-time and defending NHRA Top Fuel world champion, clocked the fastest speed in the history of the sport during the second day of qualifying at the 24th annual Lucas Oil NHRA Nationals at Brainerd International Raceway. 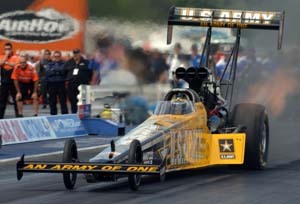 The pilot of the U.S. Army dragster goes into Sunday's eliminations in the No. 1 spot with his best effort of 4.446 seconds in a blistering 337.58 mph. Schumacher can certify the performance as an NHRA national record by clocking a speed of at least 334.21 mph on any run during the remainder of the weekend. Eric Medlen (Funny Car), Warren Johnson (Pro Stock), and G.T. 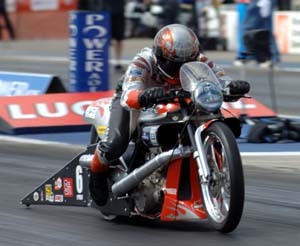 Tonglet (Pro Stock Motorcycle) also are the qualifying leaders of their classes at the $1.6 million event, the 16th of 23 races on the $50 million NHRA POWERade drag racing series' schedule. Sunday's first round of eliminations are slated for 11 a.m.
All eight of the track records set during Friday night's qualifying sessions were bettered on Saturday - in part thanks to ideal, cool weather conditions and a partly cloudy sky. "That was fantastic," Schumacher said. "From 800 feet on it was vibrating so much that it blurred my vision. I've been 335 and 336 before and that didn't happen so I thought maybe it was going 337 that did it. But we ran 330 in Round 4 and it did it again so it's something with the car that we can fix. For a minute there I thought, 'Okay, that was cool, but not the blurring part.' But it's just a harmonics deal. "You don't expect to run that here but since they ground it a few years ago the track has been great. If you can run a 4.40, you have a great track. We went 4.44 in one lane and 4.48 in the other today so I'd say this is a great track." 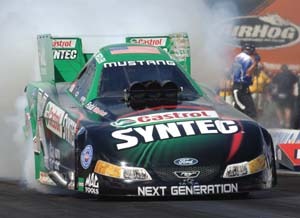 Medlen qualified at the top of his category with a 4.730 in 327.35 in his Castrol Syntec Ford Mustang. "Today we saw the advantages of having two other cars on our team," Medlen said. "Both John [Force] and Robert [Hight] were able to radio back a bunch of great info to us and the end result was that we could tune this thing for a great number. All four of our qualifying passes were stout and we're extremely pleased with the way the car has been reacting to what we're doing to it. "I think some guys were pressing today to try and match us. We saw some teams struggling, but we came through. Believe me, it's all about our crew chiefs. They're the reason this team historically has run so well at this track. It ain't the drivers. We just keep the car straight. The crew chiefs are the ones that have Brainerd figured out." 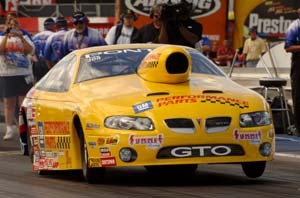 Johnson, a Minnesota native, drove his new GM Performance Parts Pontiac GTO to a category-leading performance of 6.698 in 206.57, both track records. Johnson now has 136 career No. 1 qualifying attempts - more than any other professional NHRA driver. "We felt the GTO, aero-wise, was so significantly better then our Grand Am that it was in our best interest to get it into service as soon as possible," Johnson said. "In my estimation it's the best car out there now. The Stratus has been revised four or five times and the Cobalt is right there too, so it's great for competition. "This car is so stable it's almost boring to drive down the back half. It's like my old Cutlass only the front end is so much narrower. There are five cars within five rounds of each other at the top of the points so one point here or there can be the difference. You only need to win the championship by one point so every one is important, definitely." Tonglet clinched the top qualifying spot with a track record time of 7.011 in 191.35 on his Screamin' Eagle Vance & Hines Harley-Davidson. "I know (teammate) Andrew (Hines) wanted to be No. 1 but if anyone were to take it away from him I know he's glad it's me," Tonglet said. "We're a true team. He was happy for me down there. As long as there's a Screamin' Eagle Harley on the pole, we're both happy. To be 1-2 is the best case."